Whether I”m in New York or Bangkok, the excitement of city living never fades. In New York, most residents flee to the beaches during the summer: Hamptons, Amagansett, Montauk, Martha’s Vineyard etc. In Bangkok, Thais head up-country for a little r&r, or south to charming beach towns like Hua Hin or Samed for a more robust night scene. I too sometimes crave a day away from city life, but more often than not, I’m happy as a clam exploring the city’s nooks, nibbles and nostalgia. My dad recently asked me to write up a little advice for one of his friends on where to go and what to do while in Bangkok. I furiously scribbled down a list of my favorite foods, neighborhoods, bars and markets. When I was done racking my brain, I reread the list and had a good chuckle. My number one ‘to do’ item was–meander through Bangkok’s Chinatown. Now, it’s not like I think this should be the first stop on a Bangkok city itinerary…but it’s definitely high up there. Why Chinatown? I adore diasporas in general because you can get concentrated authenticity in food, culture, music, and generally life, by just exploring these neighborhoods in your own city. The coming together of the diaspora and the local community also produces some pretty interesting mixes. An example that stands out in my mind comes from Xi’an, a province in China most well-known for the terracotta warriors. For me, this Muslim community in the middle of China was most memorable for its food (imagine that!). 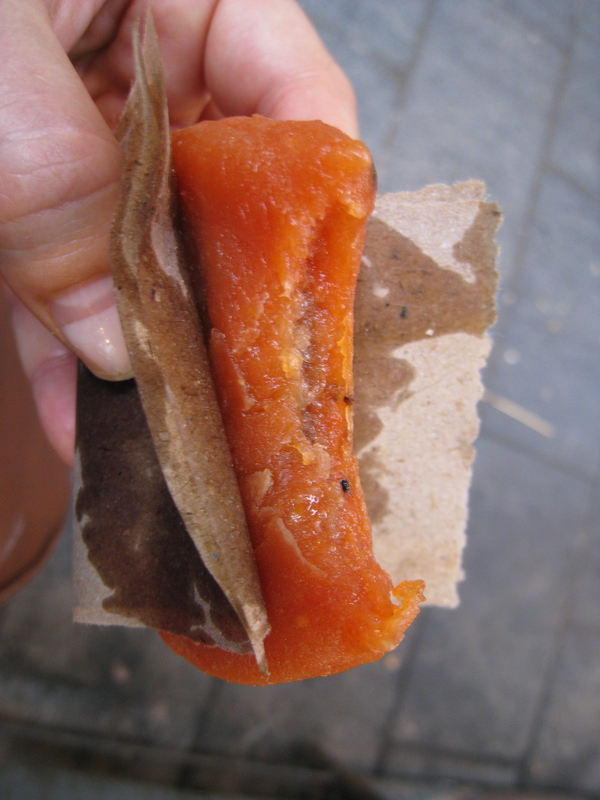 The warriors were restored beautifully and all, but the griddled persimmon stuffed with ground walnuts, orange blossom water and sugar was the standout memory from this culturally rich city… So diasporas–it’s like traveling to another country without having to leave your own city. I originally come from two states with large Chinese populations. I grew up fascinated with Chinese culture and my pops steered me along my path of curiousity. We scoured California’s dim sum palaces seeking out the plumpest har gao, ate fiery Sichuan hot pots overflowing with peppercorns, shared moon cakes with my siblings, and studied a butcher’s deftness with a cleaver as he lopped off ears and belly from a glistening roasted pig while in San Francisco. Five years ago, New York’s Chinatown became my next and new stomping ground. I now routinely compare every dumpling from every dumpling joint, walk into every musty tea shop (because I love how they use real weighted scales, count money with an abacus, and paper-wrap parcels containing earthy and pungent herbs and animal bits ), haggle with the fruit vendors under Division, and eat black sesame ice cream from Chinatown’s Ice Cream Factory at least several times each summer. Chinatowns are in my blood and I’ve actually begun to tell people I’m half Asian. It’s half true. 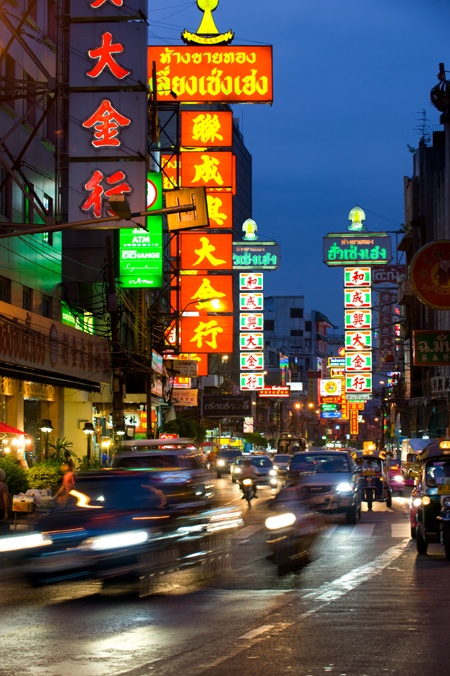 Bangkok’s Chinatown is memorable–enthralling even. Soi Texas, aside from the hordes of tourists, is exciting in that it retains a colonial charm from a hundred years ago. No other Chinatown looks quite like Bangkok’s. Even in China, I can’t say I ever saw a more exciting, bustling, crazy-energy filled neighborhood. Bangkok’s got ’em all licked. Day or night, Chinatowns are worth exploring. During the day, markets are open for business, living rooms turn into shops which turn into food stalls, fruit vendors lazily wave flies away from their tasty offerings, and everything under the sun can be found at a cheaper price here. Kitchen gadgets, hair accessories, fried bananas? Check, check and check! But of course the food, for me, is the main draw. 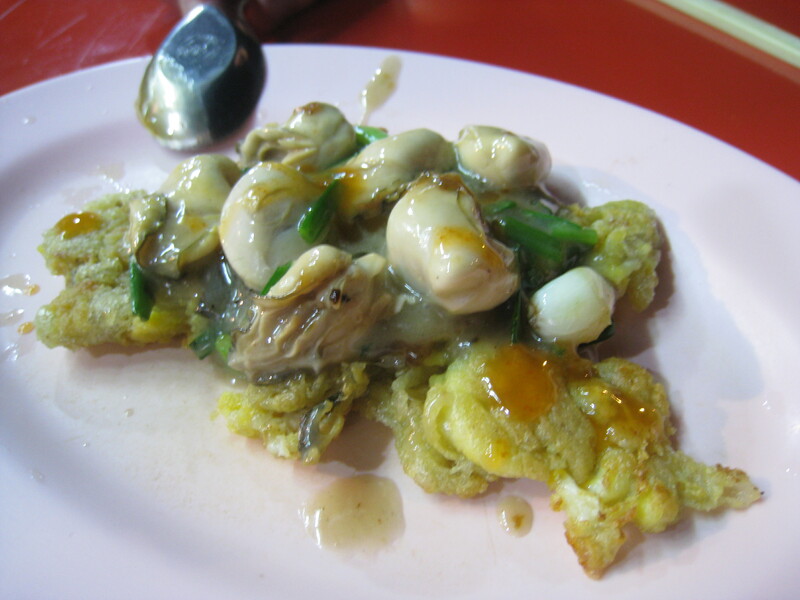 Behind Soi Texas, one block behind all the madness, is a small restaurant that serves only three items: a crisp omelette topped with oysters (or lua), a soft omelette with oysters folded in (hoi tod) and fried rice (khao phat). Oh yeah, sriracha and pickled chilis are on the table for your seasoning desires too. All three dishes are delightful, but the or lua is a culinary knock out. The crisp batter coupled with the soft bivalves is one of the best dishes to be had in this Chinese wonderland of flavors and textures. The fluorescent lighting, proximity to cars while you sit at rickety tables in the street, and the wafting aromas of pork fat and charcoal working hard to infuse the dishes with flavor all add to the al fresco dining atmosphere. Do not leave Chinatown without consuming at least one or lua. I’m giving you fair warning, you’ll be sorry if you don’t! I have to end every meal with something sweet, and thank goodness there are many, many sweet things to eat in Thailand. In Chinatown, dessert comes in so many forms, and if you have the room, you should try them all! Or, I guess a normal person would come back several times to try them all… either way, no matter. On the corner of Yaowarat and Phadung Dao Road, a woman boils small bundles of joy in boiling water. These bundles, also known as black sesame dumplings, are served in a sweet ginger broth. Toothsome, not too sweet and totally addictive, these chewy balls fill in any corners (in case you happened to restrain yourself from eating at every stall you passed along your Chinatown eating tour). 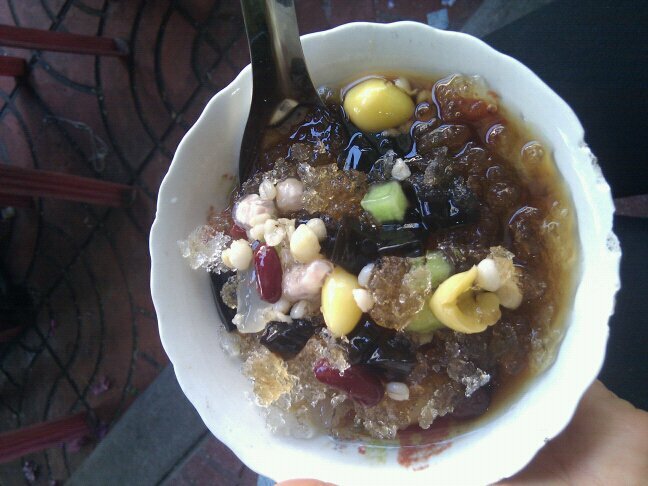 My favorite, however, is the shaved ice laden with dates, gingko nuts, water chestnuts, gummies, dried fruits, and topped off with shaved ice and another sweet ginger syrup. This option is refreshing and light and each bite provides a different texture. It’s like mining for precious jewels, only these jewels come in edible forms. There are so many stalls to sit at, juices to sip, people to stare at, and trinkets to buy in any Chinatown. So instead of running off to the country, the Hamptons, or Hua Hin, stick around the city and fire up those taste buds, poke your nose down alleys, and seek out food that transports you to other lands without ever stepping foot on a plane.